Several trends and key factors are shaping our future at an ever increasing pace – giving rise to a myriad of challenges the international community is struggling to deal with effectively. The water crisis is at the heart of this challenge, since a sustainable supply of adequate freshwater is the essential foundation of civilization as we know it. While water management is primarily a local issue, 40 per cent of the world’s population depend on transboundary freshwater resources. It is this level which is heavily influenced by the complex geopolitical power games, making international water security even more multi-faceted and multi-layered. The increasing gap between the demand for quality freshwater and its declining supply, the uneven distribution of resources, and unilateral development of water projects, are becoming frequent disruptive factors in neighbouring country relations.Water scarcity exists in many river basins around the world and comes in different forms, this map above shows different types of scarcity which are important for targeting the right solutions to the problems. Physical water scarcity (represented in orange) affects every continent and approximately one-fifth of the world population. Some of the not so obvious issues and solutions surrounding water scarcity are virtual water and bulk water transfer. Virtual water is importing and exporting the virtual water embedded in water intensive commodities. Global trade in bulk water is also gaining momentum, including the shipping of water in tankers across the ocean. 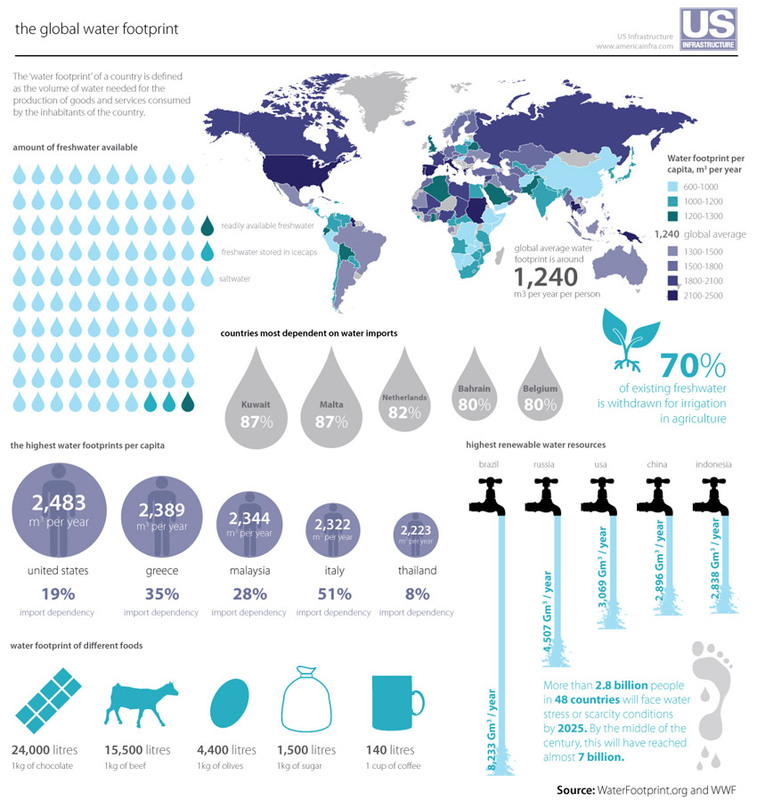 The map below shows the global water footprint – the water footprint of a country is defined by the volume of water needed for the production of goods and services consumed by the inhabitants of that country. 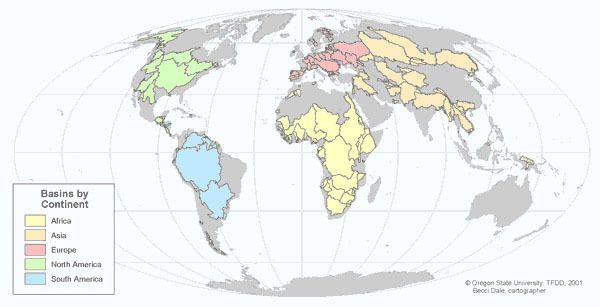 The map shows that even for countries who not share any significant transboundary water resources, they are still reliant on the goods and services produced in transboundary basins. For example Malta does not share any transboundary resources, but imports 87% of its water. This scenario demonstrates that the sustainable management of international watercourses are vital to all nations of the world not just transboundary riparian nations. While the need for strengthening water governance across all these levels has been widely acknowledged, the adoption and implementation of effective legal arrangements remain a key challenge. Given the global dimension of water insecurity and its interweaving with other crises, it is obvious that any solution to the water crisis has to look beyond the national level. Effective basin wide legal frameworks are necessary to develop, implement and enforce rules for managing water resources sustainably and addressing conflict of uses between states. Yet, the perceived threat of losing national sovereignty is increasing the political cost of good governance, too often resulting in scattered international approaches that are only rarely implemented at the national level.